We would all appreciate seeing your correlation of historical demand versus price. BP's 50 year data do not show such. How much spare capacity for heavy barrels is there in your opinion? It only takes 1B of spare to be enough! Any spare past that is irrelevant. Until you can understand and agree with what I just said about spare capacity our understanding of fundamental concepts is too different for meaningful dialog. I might suggest a question for you to ponder. 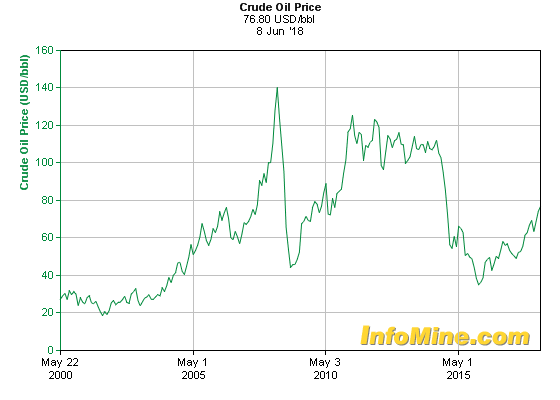 How can OPEC increase production unilaterraly? No cheating in your answer. No glossing over the fact that, ultimately, you cannot produce more than you consume. The question is basically no different that my asking how the Exxon station owner pumps additional gasoline in your car's tank after it is full. Then you missed my previous post "Price Determines Demand (and Supply)" which displays about 100 years of data. And if you drop a lighted match on to the floor you will have created additional consumption - gasoline and people! So on the front page of the main site the headline article is stating that Venezuela cannot meet its obligations, will be lucky to produce 700k barrels in June, and is basically on the verge of collapse. What effect is this going to have on prices? We're talking about potentially 2 million barrels off the market, in an already tight market? The situation in Venezuela is a dire one indeed, although the statement "2 million barrels off the market" is lacking the other variable: 2 million barrels fewer than what, exactly? We're not talking about 2 million barrels fewer than yesterday or anything. The market has already experienced--and countered--much of Venezuela's lost production. it is indeed what keeps OPEC in compliance with its production cuts thus far. Iraq and others have not been able (or willing) to stick to its share of the production cut. Venezuela has obliged. That said, Venezuela is death spiralling and how has 24 million barrels (a month's worth of exports) waiting to load, and a flurry of tankers waiting in sea to load--which in all likelihood will not be loaded. This is not just a production problem, but a logistical one--the port is not capable of that level of throughput. This is not where the oil usually loads from, but they are stuck using that for now because Conoco seized its other terminal in Bonaire. While some predicted earlier this month that this would be a disaster for Venezuela, I'm not sure most people realized the extent of the horror this would cause for them. But I think we need to be careful about saying that Venezuela's disaster will cause a too-tight market. In reality, Venezuela will likely spiral all by its little self. Other countries will make up for its future loss (smaller than 2 million bpd). Other countries have already made up for its loss thus far, at least mostly. India will be hit hard by Venezuela's shortage, and normally I'd say they'd look to Iran to fulfill its oil hunger, but threat of US sanctions will put the kibosh on that. Iraq. however, I believe as India's #1 supplier already, will be too happy to fill this need , and Saudi Arabia will likely extend a helping hand too--but at higher prices, simply because they can. I see no global oil shortage looming that would push up prices to unreasonable levels, but it should keep prices from bottoming out, as someone else suggested above. Ok I guess despite your claim that there is plenty of spare heavy oil capacity, we will say there is one barrel, that seems to be your answer, or perhaps if Venezuelan output has decreased by 700 kb/d, there is 700,001 barrels per day of spare capacity. You claim the number doesn't matter, but the market seems to think differently. Lets say I have a 15 gallon tank in my car and want more gasoline. I would typically use 5 gallon containers for the extra fuel, makes more sense than putting on the ground. If production is always the same as consumption (both long term and short term) can you explain why inventory levels do not remain constant? I think we are in agreement that over the long term production and consumption will be equal. Short term changes in inventory will influence the price of oil over the short term. The long term price will be determined by the marginal cost of supply. Yes that is correct, as long as there is enough output is equal to consumption, there is no problem. And yes one cannot consume what has not been produced. You have heard of storage tanks I imagine. When there is more produced than is consumed, inventory increases. OPEC can cut prices to sell more oil, that's the typical move when inventory increases to levels higher than desired. You claimed there is a lot of spare capacity, if 700 kb/d is needed, I guess you think there are 700,001 barrels per day. The market gets pretty nervous when spare capacity falls below about 1 Mb/d. We may be getting pretty close to that with the fall in Venezuelan output and the future fall in Iranian output due to sanctions. That will tend to put upward pressure on the oil price. In fact World spare capacity may fall pretty close to 1 barrel per day if OPEC and Russia increase output by 1 Mb/d, any further shocks to the system would be more likely to lead to an oil price spike. Please define for us, Dennis, where you get the numbers that tell you how much spare capacity, demand or inventory exist TODAY that allow you to be fearful of supply availability. I suspect that all you can give us are yours, or somebody else's, guess, since actual data will not be known for months, or years, or possibly never. And even when it becomes available it is almost never checked against the earlier "guesses". You are operating in the dream world. And in that world, anybody can have opinions and they are all equally useful -- or not. It is true, of course, that traders buy and sell futures contracts based on data no better than your dreams. I agree we don't have good data on spare capacity, only guesses. I was not the one who claimed there was a lot of heavy oil spare capacity. That was your opinion, not mine. Then you quickly claimed it didn't matter when I called you on it. A. There is plenty of spare heavy oil capacity. B. Plenty is equal to one barrel per day. C. William has no idea how much spare capacity exists today, and neither does Dennis. So this was your dream William, not mine. As to my "data". OPEC and Russia et al cut output by about 1.8 Mb/d starting at the end of 2016, I assume in November 2016 those nations were producing at their maximum. Venezuelan output has fallen by about 700 kb/d since 2016 Libyan and Nigerian output has increased (about 300 kb/d for Libya and Nigeria combined) since the near term OPEC peak of Nov 2016, in fact the spare capacity of KSA may only be 700 kb/d (difference from Nov 2016 and April 2018 KSA output), just about enough to offset the Venezuelan decrease of 600 kb/d over the same period (and the Venezuelan output may have dropped more since April). Iranian output is likely to drop with sanctions, probably about 300 kb/d and this might be offset by increased Russian output. Consumption of C+C is likely to increase by at least 800 kb/d (long term trend since 1985). That increase might be met by US LTO increases if pipeline constraints and the low wellhead price don't reduce the well completion rate. All in all there are good reasons to suspect a tight market where consumption may be higher than production in the short term and lead to lower oil stock levels, eventually (after a 3 to 6 month lag) this will lead to upward pressure on the price of oil. You are right, Dennis, my dream is that there is enough. And enough is all that matters. I base my assessment on 100 years of data in which there has always been enough, in spite of many dreams over that time that claimed there wasn't enough based on price moves which were never substantiated when data became available. Silly dreamers! But when everyone buys into the same dream world it can be quite popular. Such is the essence of futures price volatility. I agree there will be no shortage, but I think we will tend to see higher prices as the lack of spare capacity becomes evident in 6 to 12 months. Clearly neither of us can predict the future accurately (or I can't, perhaps you can). 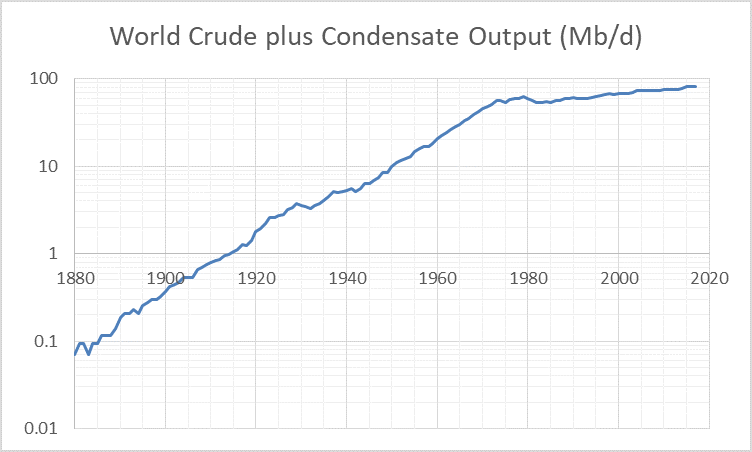 The data for World Crude plus condensate output since 1880 shows about a 6.9% per year average annual increase in output from 1880 to 1974, from 1975-1982 there was a slow rise until 1980 followed by a steep decline in output (Iranian Revolution and Iran-Iraq War), from 1982 to 2017 output rose by 1.2% per year, an almost 6 fold decrease from the historical rate of increase in output. I guess you are suggesting that supply and demand have always matched over the long term and this will continue in the future. I agree! This does not mean that growth in output will continue forever however, simply that consumption will adjust to available supply, as it always has, in addition over the long term the oil will be produced up to the point that the marginal cost of the most expensive barrel produced is equal to the marginal revenue earned when that barrel is sold. In geophysical terms the oil is becoming more difficult to produce and marginal costs are increasing. Oil producers like Mike Shellman will tell you that the $40/b breakeven costs for tight oil production claimed in Investor presentations is bunk. The average 2016 Permian basin well needs about $85/b at the wellhead to earn a decent internal rate of return, the shale producers need higher oil prices in the long run or they will go bankrupt. Note that just as there was a shift in the growth rate of oil output from the 1880-1974 period to the 1982-2017 period, there is likely to be two more shifts. The first shift will be to an undulating plateau of no World C+C output growth from 2023 to 2032, after that there will be a gradual transition to declining oil output from 2035 to 2060 at about a 2.5% annual rate of decline. Beyond that there may be steeper decline as alternatives to oil powered transport replace the internal combustion engine, which will become about as common a form of transportation as horses are today. Your statement "This does not mean that growth in output will continue forever however, simply that consumption will adjust to available supply, as it always has, in addition over the long term the oil will be produced up to the point that the marginal cost of the most expensive barrel produced is equal to the marginal revenue earned when that barrel is sold." sounds like something you might read in a college economics textbook. It is total garbage. Reality is that supply will match consumption. Reality is that the instantaneous price will have little to do with production cost, which, by the way, is itself an ambiguous concept. The price, as determined by whatever entity performs that function, will not be the result of cost calculations. Further, reality is that, in the current odd system, the last barrel, the marginal barrel, is supplied by the lowest cost producer, Saudi Arabia. The highest cost barrel is produced by those who missed their forecast of crude prices when they approved the production projects and are producing to meet their loan payments. You will not get this reality from those who never bought and sold a commercial parcel of oil. Alert me when WTI get to $55.00bbl. I'll take a look at it then. FYI - I've been in this market from $45.00 - $120.00 - $35.00 - to here in various positions. This is not a time to worry or panic. Me ? I good here. Collect the dividends and distributions and keep some powder dry for another shot later. I bought my first heating oil contract at $0.45/gal when the contract first started in 1978. I sold at $0.65/gal. Boy, did I feel smart. Six months later my education began when reality set in and the professionals in the pit began teaching me the facts of speculative trading by taking me to the woodshed. The cost of my "tuition" was quite high. Supply matching consumption is no different than consumption matching supply. In the long run oil must be produced profitably, if it is not profitable to produce oil, nobody will bother. The marginal barrel is the most costly to produce, by definition. So no it is unlikely that Saudi barrels are the "marginal barrels". Yes the instantaneous price has little to do with production costs. Much of producer revenue is based on long term contracts and those will be based both on daily weekly or monthly prices in the past as well as the futures strip. The decision on whether to start an oil project will be based on the producers evaluation of the future, much of this is based on past experience and on both past cost and past revenue used to project future costs and prices. The producer that consistently has costs of production that are higher than revenue will not be in business for long. I never suggested price is determined by cost. The price is exogenous to the producer (especially smaller producers), the point is simply that for any set of producers they will produce up to the point that marginal cost is equal to the price if they want to maximize their profits. KSA (and other OPEC producers) produce what they want to achieve their output or revenue target, all other producers just take the market price as given and maximize profits. Those producers who do a poor job of maximizing profits will not be producing for long. Was supply matching consumption in 1980-1984? I would say that supply was constrained over that period and that consumption adjusted to available supply. I agree that typically supply adjusts to demand, but as oil production reaches peak output (probably between 2025 and 2035) consumption will adjust to supply as high oil prices result in demand destruction so that consumption and production will match. You say "Supply matching consumption is no different than consumption matching supply." Absolutely wrong, but consistent with your previously stated, erroneous claim that demand sets the price. It makes a difference whether the cart is behind or in front of the cart. The price will adjust to cause supply and demand to match. Sometimes this will require a higher price to both throttle demand and increase supply. Other times the price will fall as too much supply capability creates desperate sellers and the lower price will allow demand to grow and and supply will drop to match. "The marginal barrel is the most costly to produce, by definition. ', you say. Not by any valid definition, and not the experience of the industry for the past 50 years. Check the facts. Which producer supplies the barrels if more supply is needed? Saudi Arabia. Which producer shuts in when demand is filled? Saudi Arabia. That denotes Saudi Arabia as the marginal producer by the common definition. Check the facts. I am not sure that this exchange is getting us anywhere or is even of any benefit to the readers. I agree demand alone does not determine price, the interaction of supply and demand will determine the price level and your description matches my understanding. 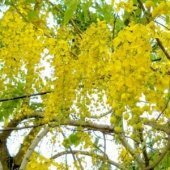 The point was simply that supply is not the only thing that adjusts, in fact what will change is the price so that the quantity of supply matches the quantity of demand in the long run. Let's imagine in the short run producers are producing all the oil they can at maximum output levels, and also imagine that at the current price level consumers want to consume more oil than is being produced. I would say that in that case consumption will adjust to demand (for simplicity we will assume a World with no inventory to draw on), oil prices will tend to increase as consumers chase limited barrels and price level increases to the point that consumption will equal production. In other cases (an overproduction scenario) suppliers will reduce the price level to try to unload their produced oil. In the long run suppliers will attempt to adjust to consumption, when a resource is limited eventually production becomes more costly. I am using the economics definition for marginal producer. "An individual producing company within an industry that is only just making a profit on their products at prevailing market prices. 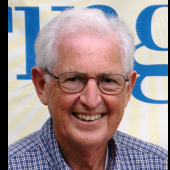 Such an organization may operate on too small a scale to take advantage of economies that benefit larger producers." The quote above does not sound like Saudi Aramco to me. If that is what you think of as a marginal producer, then there’s no surprise we are on such different pages. I define the marginal, or swing, producer as the one that provides the last increment of supply. Of course that is a completely different concept from your definition. I am not sure that this exchange... is even of any benefit to the readers. Of all the things you have said in this community, I have never disagreed with you more vehemently than now. I find this conversation extremely beneficial. Judging by the total views for this particular thread I believe I am not in the minority. Carry on. That is all. Absolutely wrong, but consistent with your previously stated, erroneous claim that demand sets the price. Please take care with absolutes, William. Opposing / differing viewpoints are allowed. There are absolutes, Tom, not ini viewpoint but in facts. Sometimes the two are confused, however. If I tell you that rain is dry, you are completely justified in telling me that I am absolutely wrong. I take your point, however, that there are times when one should gracefully withdraw. Thanks. I was embarrassed that I spent time discussing differences that were the result of my not defining terms. I judge that to be a waste of peoples time., for which I apologize. I bet that oil will go down, then up and the trend will continue forever. And I agree. Further I agree that the way to get a sense of prices is to look at history, the way you have done. Extending the time further back in history adds additional perspective. With the announcement that OPEC will increase oil production, I sense a lot of angst among investors relative to oil prices. Likely, this will lower prices for awhile (if we follow the mantra of supply and demand as the official guide). However, midstream investors should not be affected as much since they serve as a toll gate for oil/gas transmission. Lower prices would increase volume and theoretically hike revenues/profits for midstream companies. This is the logical approach; however, often the financial markets act illogically and the reverse becomes true; ironically, midstream entities often become caught up in the frenzy of fluctuating prices and suffer unnecessarily. I would enjoy others' perspective on this subject. Am I overlooking other dynamics? Thanks! Charlie.